We're still settling into our little apartment, making it home. It's been a slower process than I anticipated. While I enjoy decorating and am used to guiding others through decisions in their own homes, things move more at molasses speed when I'm working for myself. Our apartment was truly a blank slate when we arrived. We sold almost all of our furniture before moving. Our bigger pieces were a combination of hand-me-downs, Craigslist, and Ikea. Nothing was in pristine condition and we didn't love any of the pieces enough to haul up here. We thought we'd start fresh once we got to Minneapolis. Now, to be upfront, most of our things are still a mix of second hand pieces or some Ikea finds. But they functionally and aesthetically work much better. I feel years away from really "investing" in our absolute dream couch or perfect dining room table. 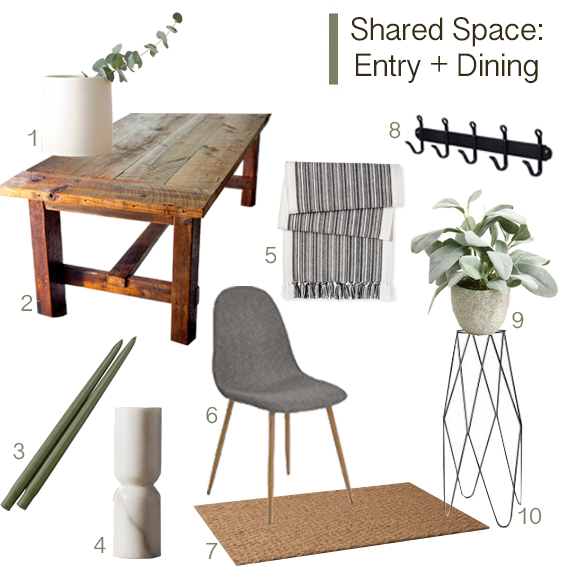 We are still renting after all - I don't want to buy pieces perfectly fit for a very temporary space. Plus, all of our older friends wisely tell us to wait until we're clear of the toddler years to invest in anything too nice. Like I said, years away. For now, we are focusing on designing and filling our home slowly and purposefully. When Isaac and I got married, there was barely enough time to step foot into our new apartment before we flew to Ikea, gift cards in hand, and sprinted through the vignettes Supermarket Sweep style. (Maybe I'm remembering this a little exaggerated, but you weren't there.) They say Ikea is the ultimate test for couples. However, most couples don't have "free money" from wedding guests. No fighting happened, but no real planning happened either. Just 3 years later, we parted with a majority of the big and small things we purchased. I am still learning so much about how to incorporate slow buying, but I believe it is more important to me and more present in my mind than it was even a few years ago. Isaac and I both vowed not to Supermarket-Sweep-it this time. Put down the Butterball. I mean floor lamp. This long intro is to say: our home is a process. One piece at a time. We spent our first days focusing on our kitchen and living room. However, our dining room ended up being the room we spend the most time in. This is the first room people walk into, so it's already a shared entry/dining space. Isaac and I spend many days working from home, so it's taken on the role of office as well. For our first month or so, this room was a strange catch-all for items left to find their proper spot. And as mentioned above - we didn't move our table or chairs, so there was nothing to actually fill the room up. We knew we needed a table to build around, but were just a litttttle picky about the right one. We wanted something sturdy and tough. Real wood, no veneers. We do some much around our table, it needed to be able to wether some tough love. We also wanted a 4-6 person table that could expand to seat 10-12. It was important to us to be able to seat enough people for a big dinner, but that larger size would overpower the room in the everyday. We also could not spend a fortune. Okay, so you see the problem. We looked for about 6 weeks until we found a custom wood table seating 6 and expanding to seat 12. Right at our price range. In town. It looks really strangely close to the table pictured below. It was a custom-made table from a Minnesotan craftsman, and the owners had just changed their style and purchased something else. It was far more farmhouse/rustic than I was originally thinking - nothing else in our place screams rustic at all. However functionally, it is perfect. It can handle any stains or scratches I throw at it and it's the perfect size - able to expand to seat a larger group. It hit all the important marks, so we jumped on it and I've been working to incorporate it with the rest of our home and soften the rustic edge a little. We started with the chairs, opting for a gray fabric in a mid-century mold. They tie in with our living room couch and are so comfortable to work at all day. Keeping the walls bright white and throwing in black and white fabric, earthy fibers, and plenty of natural greens has helped soften the space and break up all the wood in the room. It has come together aesthetically and functionally to work as a multi-purpose space. Below are some pieces we've found along with a few wish-list items. The bigger pieces came from Craigslist and Amazon and we've filled in the gaps with some Ikea finds, thrifted goods, and pieces we previously owned. With some art and a few small details left to go, it's getting there. As fun as it has been to source new things for the room and see it come together, the best moments by far have been when friends are over and we're not thinking about the table at all. I'm not thinking about the rustic/modern balance. I'm thinking about who needs a wine refill? Throughout our settling process, I can't quite get the idea of designing for community out of my head. Could function and purpose be worth sacrificing our idea of the "perfect look" - or do we have to decide between the two? Could others - people that don't live with us - be considered in our design choices? Even more than ourselves? I'm definitely still developing my thoughts here. Once I collect them a bit more, I'd be anxious to hear what you think. Do you find yourself blending different aesthetics to meet your functional needs? And what are your sources for decorating - specifically second hand? I'd love to know!